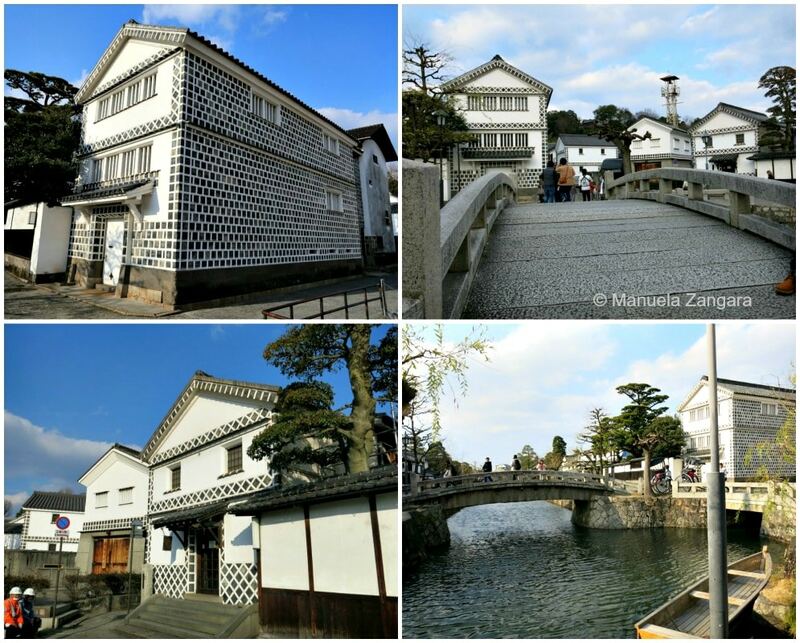 Kurashiki is located in Okayama Prefecture, not far from the prefectural capital of Okayama. I had always been intrigued by this town and I was sorry to leave it out of our 2015 itinerary, so this time I made sure to include it. 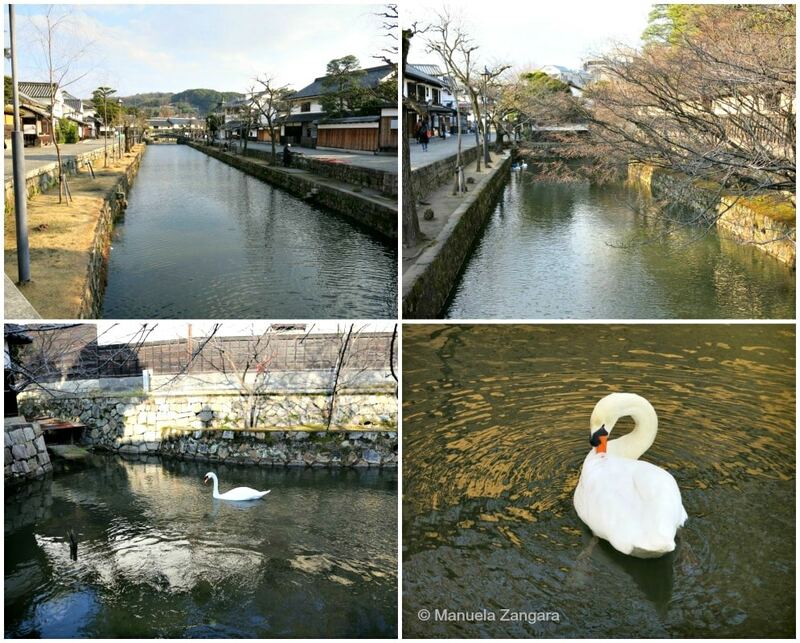 Kurashiki has a preserved canal area that dates back to the Edo Period (1603-1867), when the city served as an important rice distribution centre. 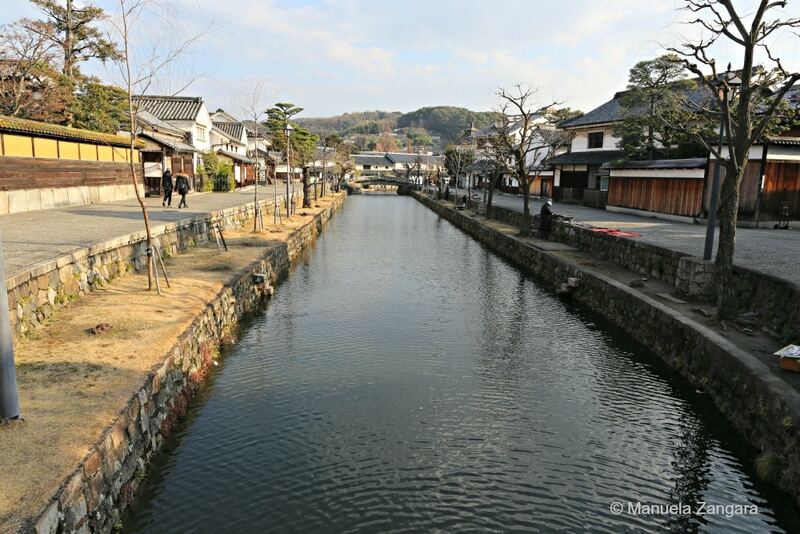 In fact, the name “Kurashiki” can be roughly translated as “town of storehouses”, which refers to the storehouses in which the rice was kept. 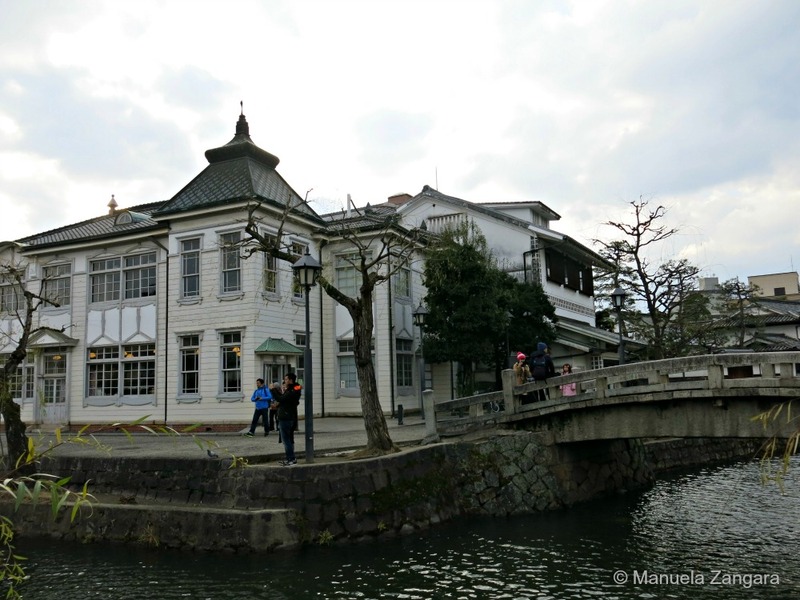 Many of Kurashiki’s former storehouses have been converted into museums, boutiques and cafes. 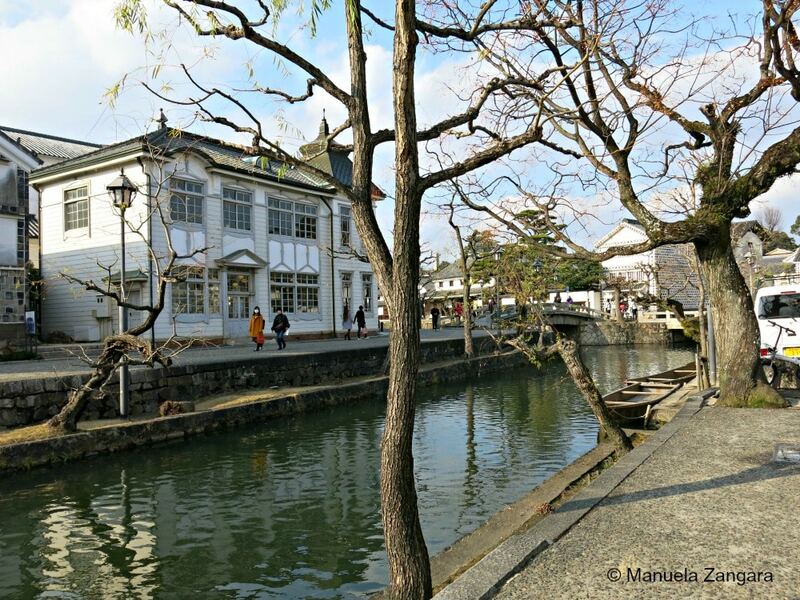 The canal area is a ten minute walk from Kurashiki Station. 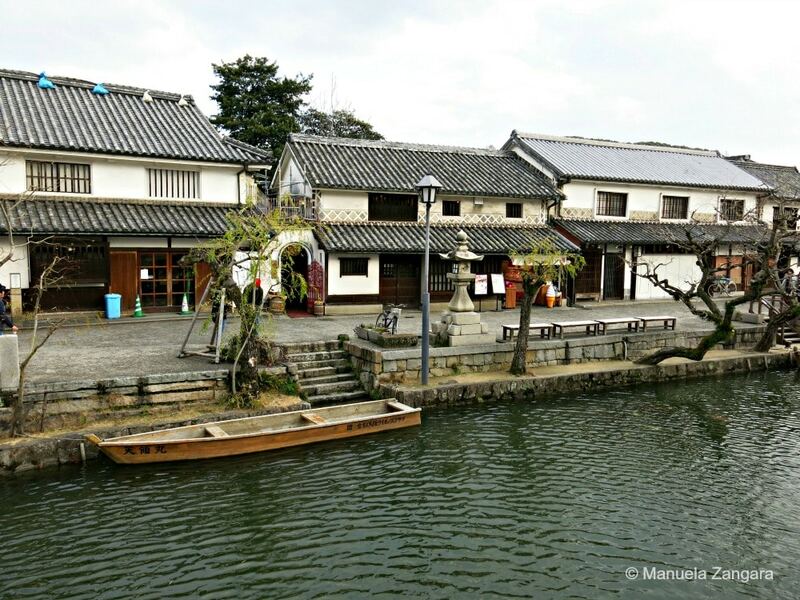 Kurashiki’s main attraction is the canal area, known as Bikan. 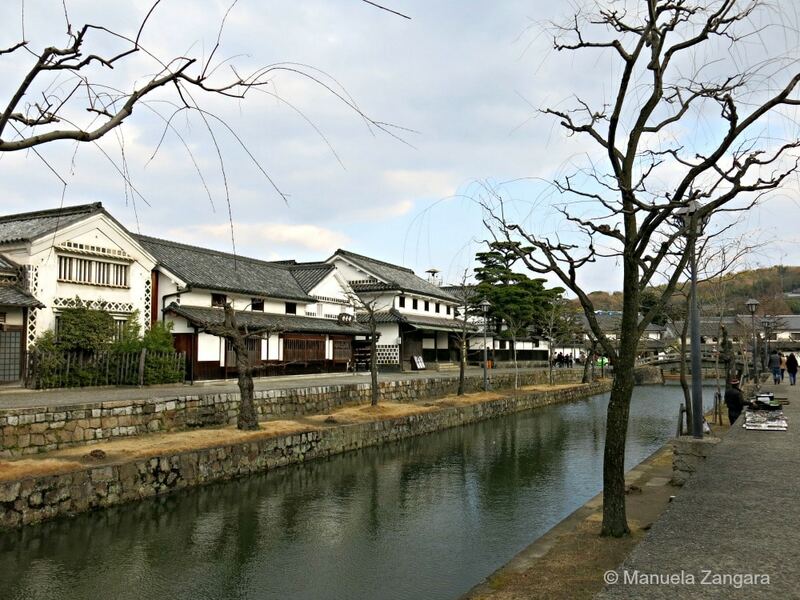 During the Edo Period, Kurashiki was an important point along the distribution route of rice. 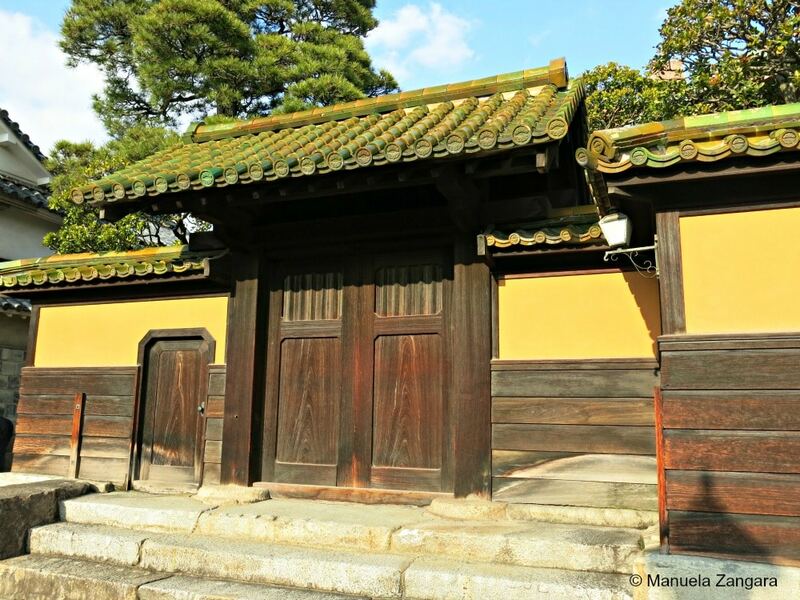 Large quantities of rice from the surrounding area were brought into Kurashiki and stored in storehouses before being shipped to Osaka and Edo. Canals were built to allow boats to navigate between the city’s storehouses and the nearby port. 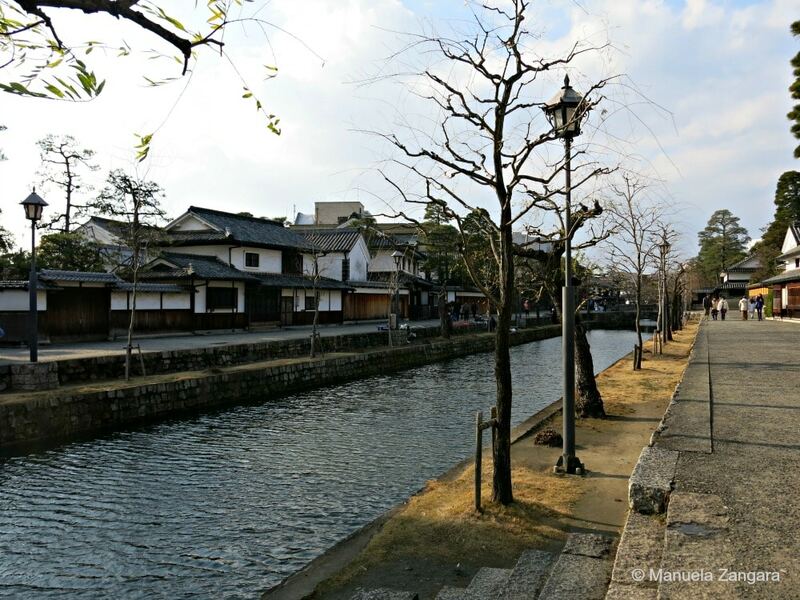 A central section of the city’s former canal system has been preserved in the Bikan Historical Quarter. The weeping willow trees that line the canal and the stone bridges that cross over the water make for a picturesque scene. Along the canal, there are many of the original storehouses. 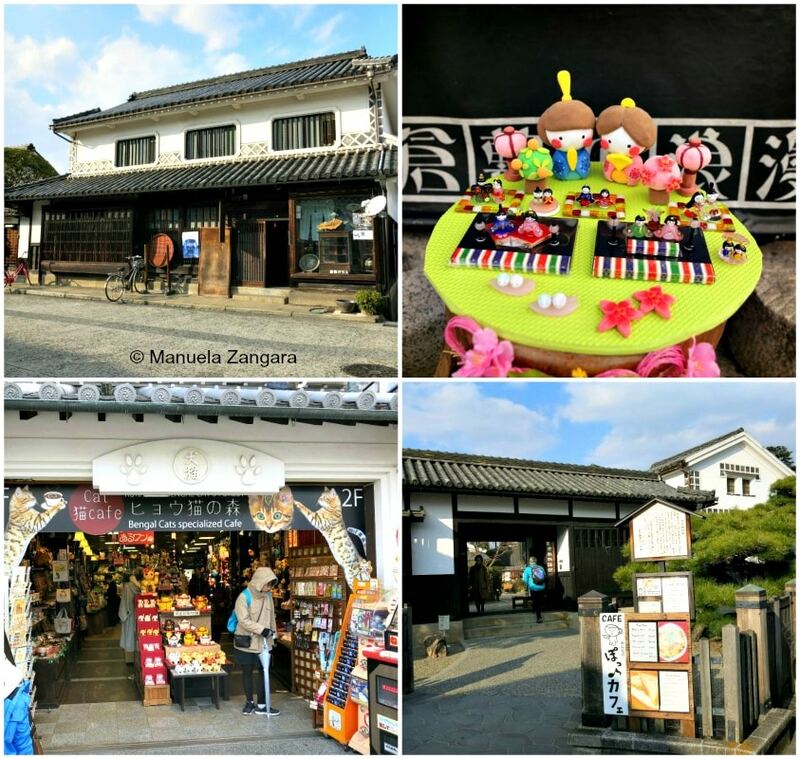 Recognizable by their white walls and black tiles, the former storehouses have been converted into cafes, boutiques, souvenir shops and a number of museums: the Museum of Folkcraft, where you can find examples of everyday items from across Japan, including textiles, ceramics, lacquerware, etc. ; the Toy Museum which features examples of old toys from all over Japan; the Archaeological Museum; and the Kake Museum that displays art preservation and restoration techniques. 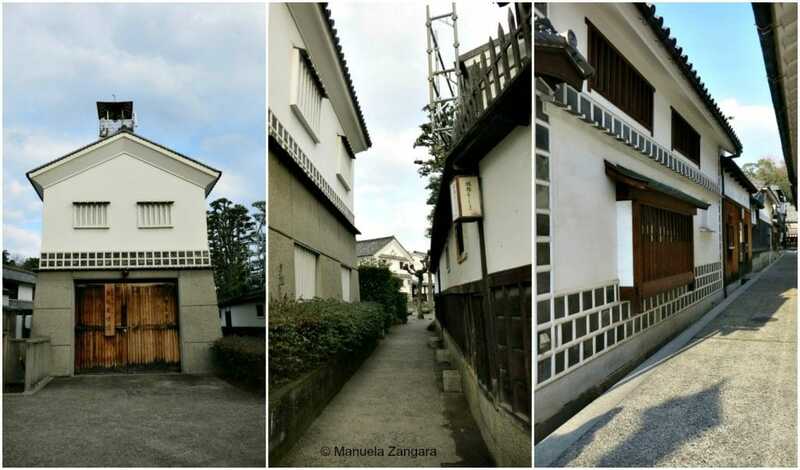 The Ohara Museum is also in the Bikan area, but it is not a converted storehouse. 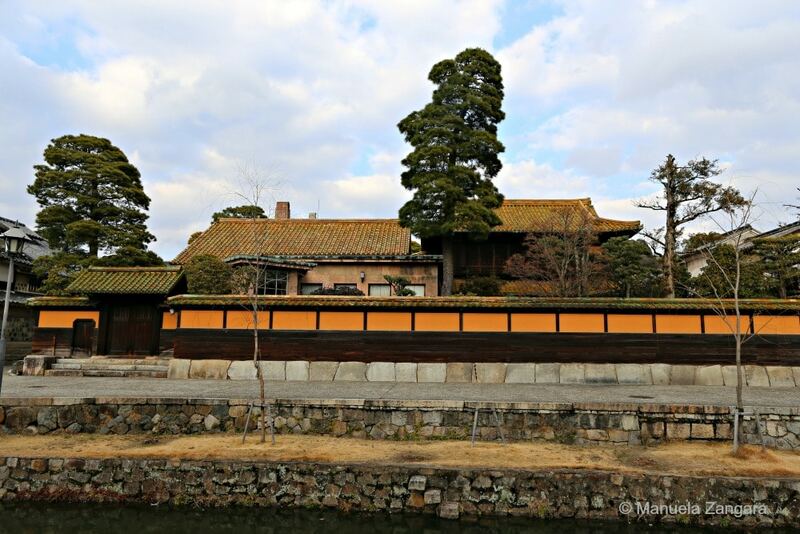 It was built in 1930 specifically as the first museum of Western art in Japan. 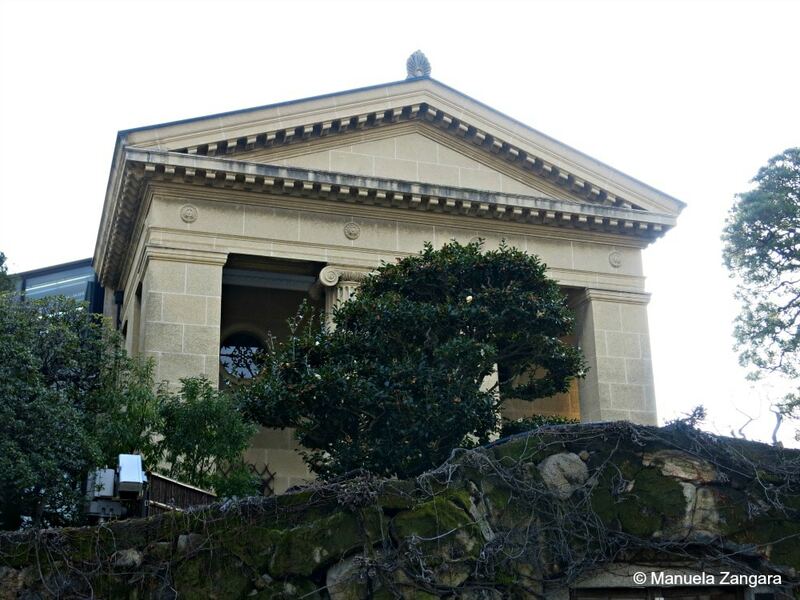 It houses an impressive collection of Western masterpieces by artists such as Picasso, El Greco, Gauguin, Modigliani, Rodin, Klee, Pollock and Kandinsky. Near the Bikan area, you can find Ivy Square. 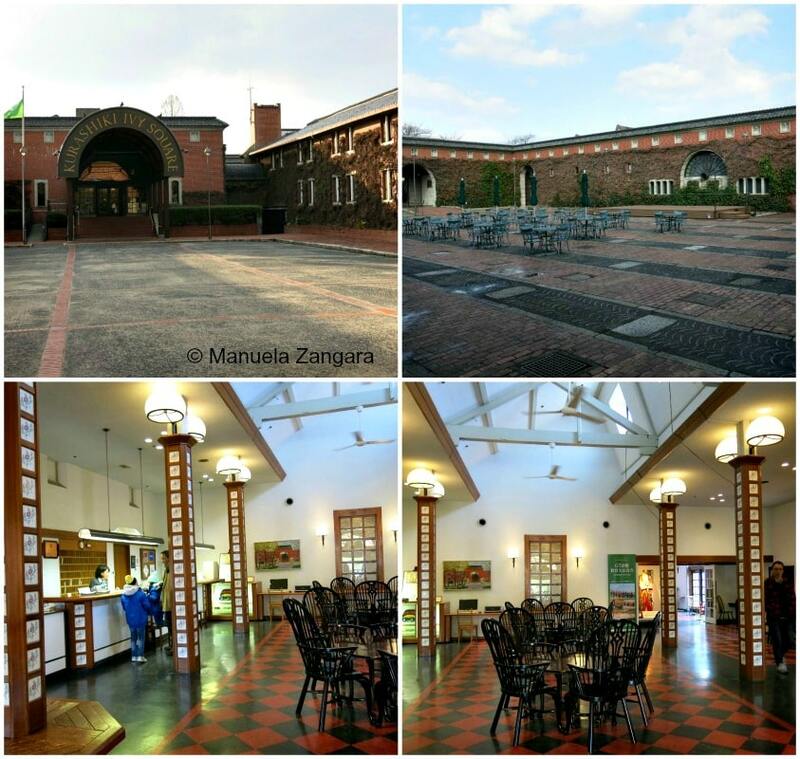 It is a complex of brick buildings covered in ivy that include museums, restaurants and a hotel (our hotel!). The area was the site of the first modern cotton mill in Japan, and the brick buildings were originally built as part of the mill in 1889. There is also a Piggybank Museum that displays a large collection of piggy banks that were all made in Japan. 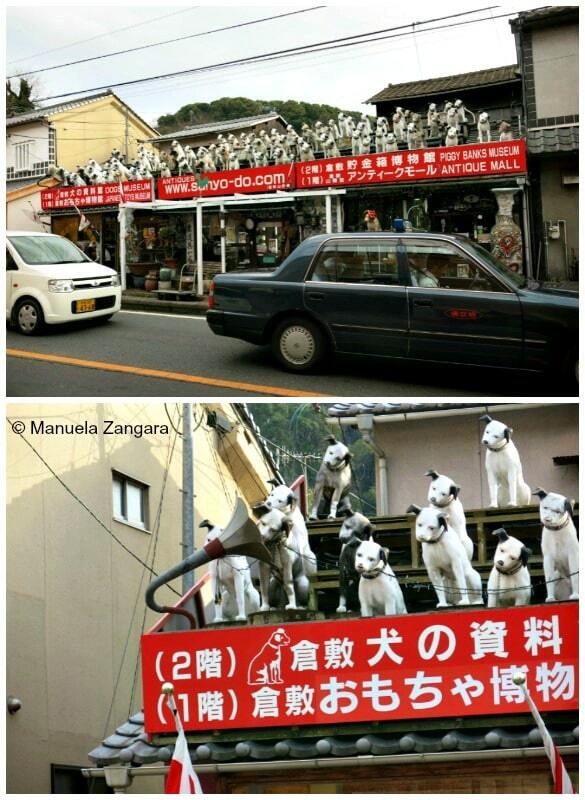 The museum, located outside Ivy Square, is recognizable by the many identical dog statues perched on the building’s roof. 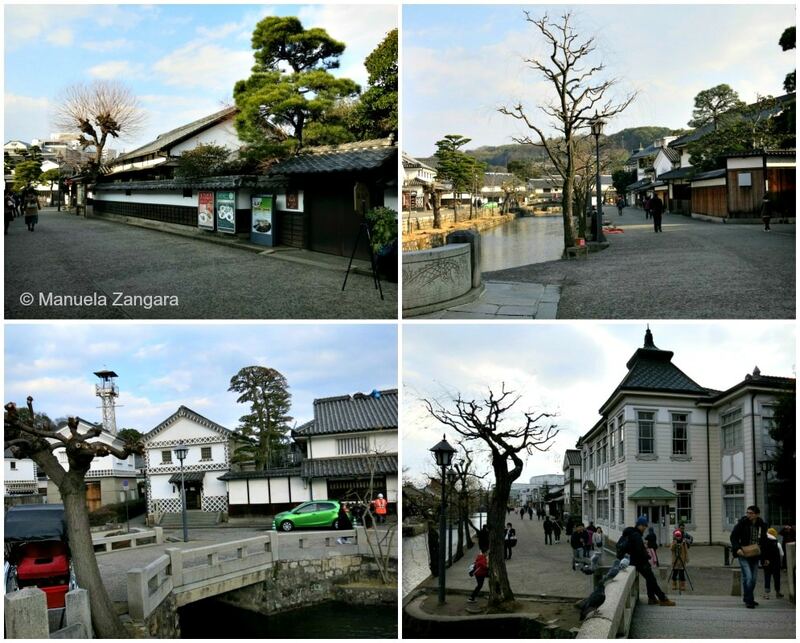 There are many accommodation options in Kurashiki: from business hotels, to amazing (and very expensive ryokans). We decided we wanted to try something different (and not as expensive as the local ryokans!) and we settled for the Ivy Square. As you read above, it is a hotel in the Ivy Square complex. 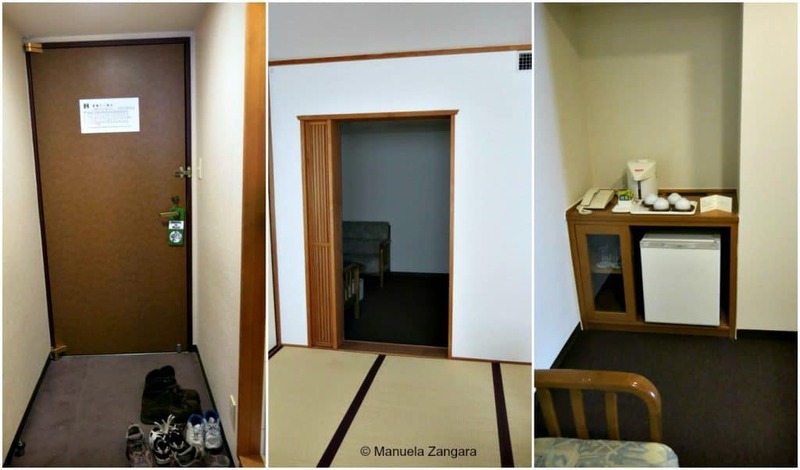 It has both Western and Japanese style rooms. 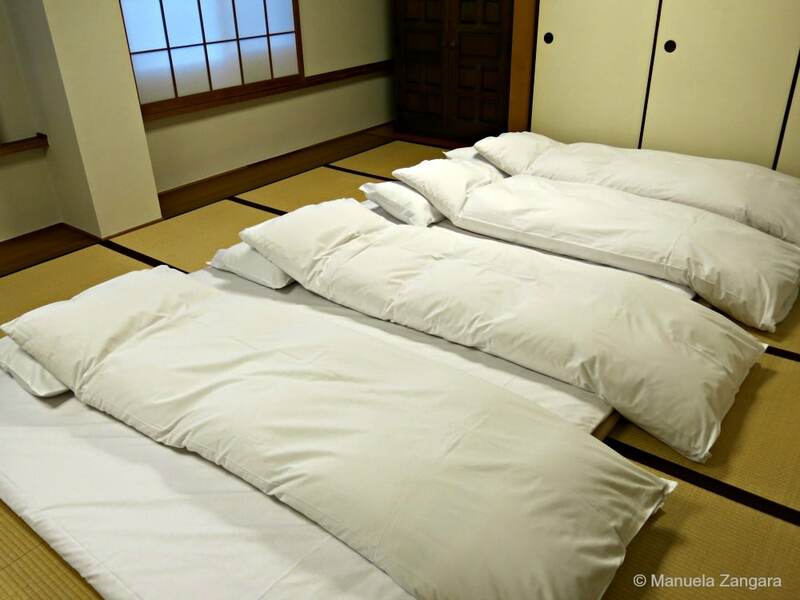 Being in 4, we opted for a Japanese style room with bathroom. 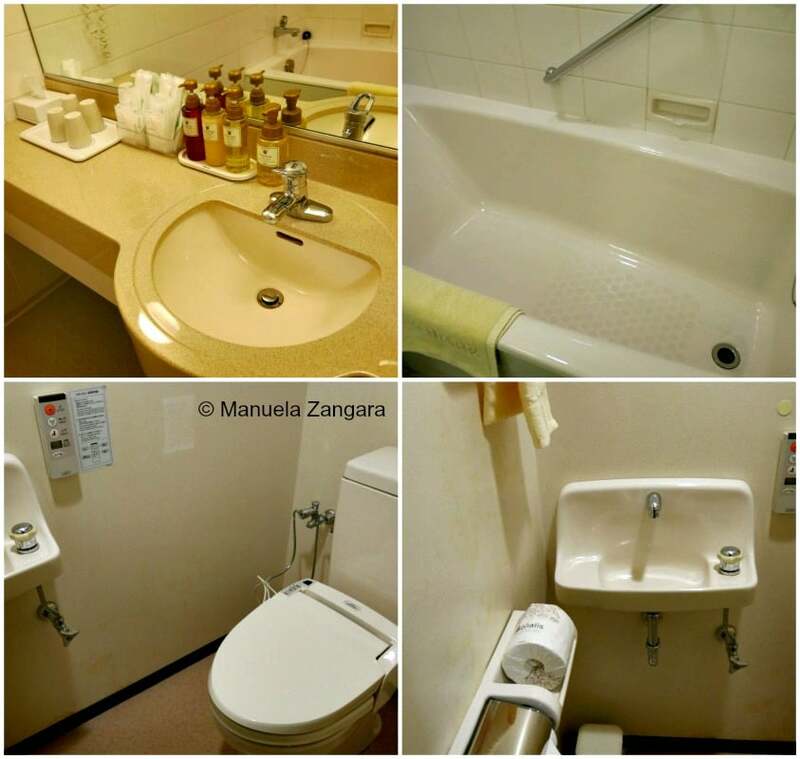 We booked through Japan I Can and we got an amazingly good deal! It was the cheapest room of the whole holiday (about 14,000 yen). I was a bit worried before going, but I was completely amazed by the room, the hotel and the service. It was just perfect. And a little Western style sitting room with a fridge, that was perfect to have breakfast in. we also had dinner in it… We went to a local supermarket and got some delicious ready-made food (including gyoza, sushi and sashimi) and had a lovely family dinner. It was quite cold outside to go out after a tiring day. The hotel also has a quite good onsen, which we did try! I highly recommend the Ivy Square for the comfort of the room and its great value and friendly service. 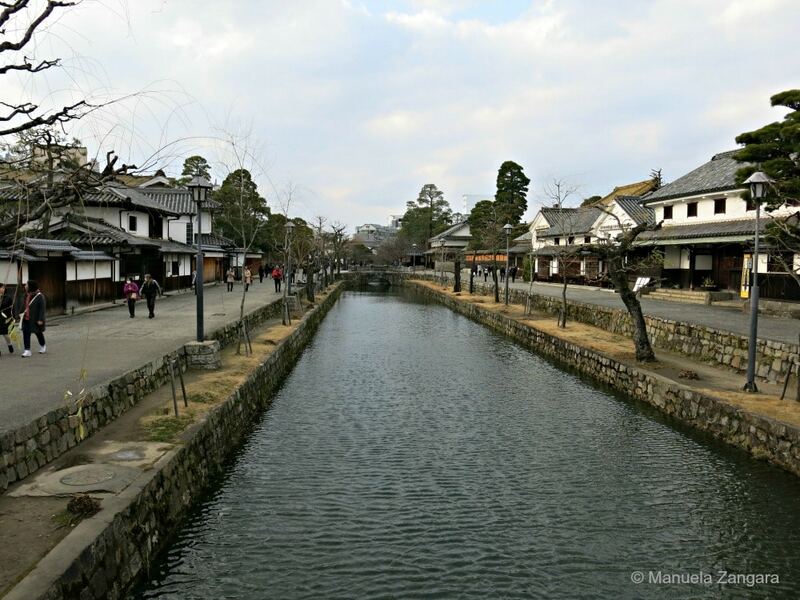 Besides, it is also a 5 minute walk from the Bikan area! 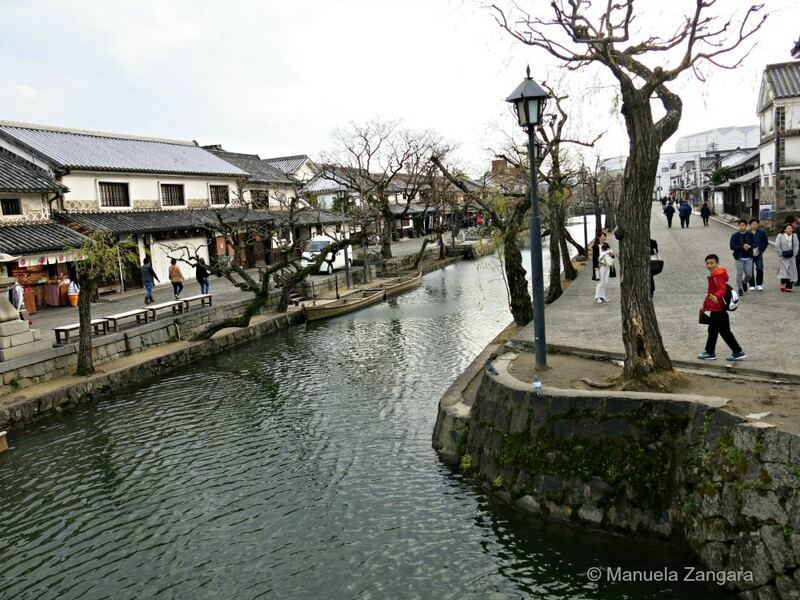 Kurashiki’s attractions are all cantered around the city’s historic canal district, which is a 10-15 minute walk from Kurashiki Station’s south exit. A main road, Motomachi-dori, leads south from the station to the canal area, but walking through a parallel shopping arcade is more enjoyable and almost as fast. 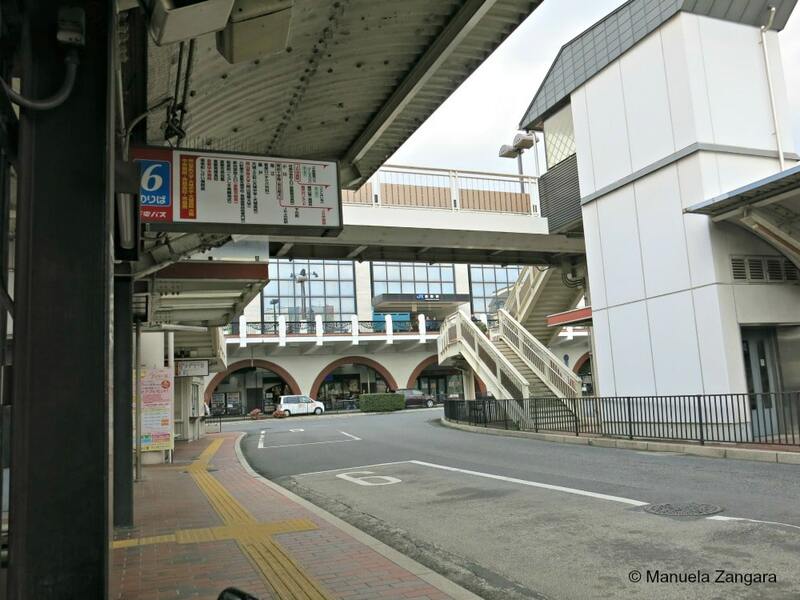 If you do not wish to walk from the station, you can take a bus to Ohara Bijutsukan bus stop, which is located just beside the Ohara Museum. If going to Ivy Square, take the bus from stand #6 just outside the station. 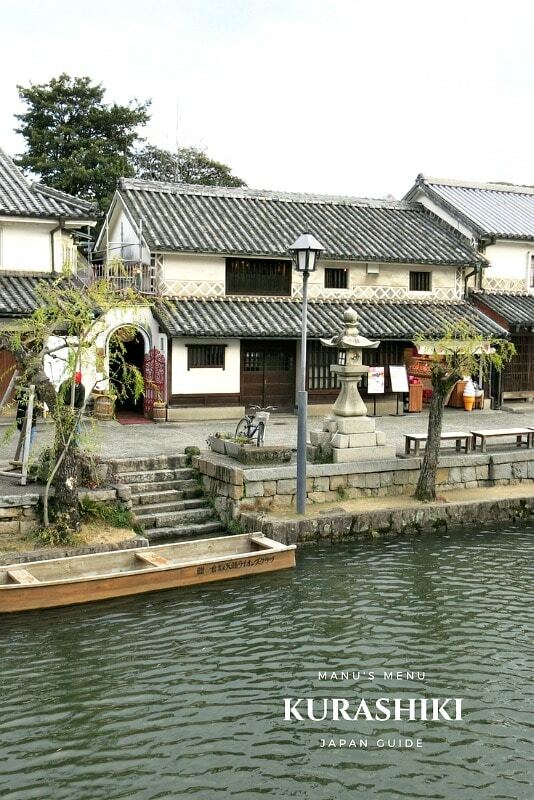 It is generally easiest to access Kurashiki by train from Okayama. Okayama Station and Kurashiki Station are connected by frequently departing local and rapid trains along the JR Sanyo Line. The one way trip takes around 15 minutes. Kurashiki also has its own shinkansen station, Shin-Kurashiki Station, but it less conveniently located than Kurashiki Station and is only served by Kodama trains.